Also, I’m not the biggest fan of doing typesetting…but this experience really helps me understand how difficult it can be finding phrasing that not only sounds in character, but also fits within the constraints of those darned speech bubbles! edit: One more thing I’ve learnt since is that “koumori-gasa,” literally “bat umbrella” is the Japanese term for the huge Western style umbrella. And that’s why Slaine having one is such a huge thing for all these AU stories from the studio (e.g. 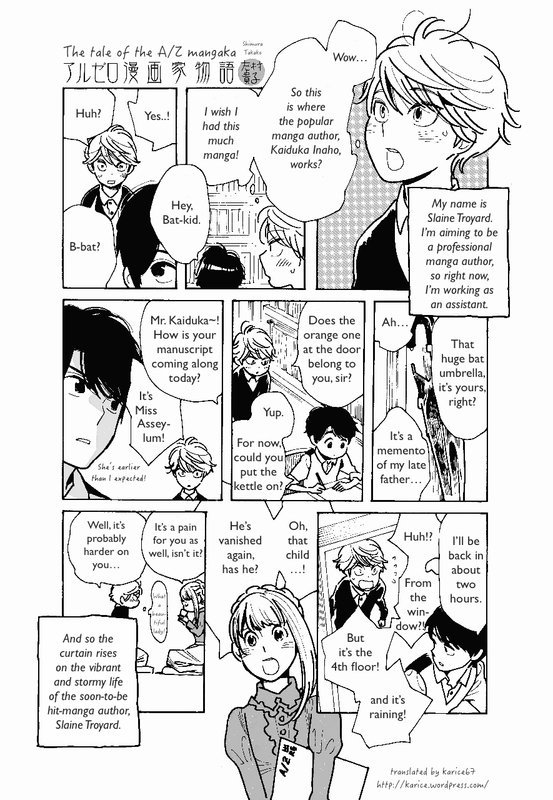 the extra story 3 drama CD) and this little comic from Shimura! Hehe…I loved that exchange!! It was sooo cute! For Valentine’s Day? In the show itself? Well, I highly doubt it’s Valentine’s Day in the show! But there’s been soooo much stuff on twitter! Er…I spent half my morning translating and typesetting this, so I still haven’t written anything about the episode! Before Inaho apologies to Inko, he said: “But I can’t see what I really want to know.” Which is the princess, I think he is apologizing to her not returning her feelings. Inko said “Mo”, which in English was translated to “Jerk”. Isn’t in Asia culture when the names are very similar, usually it is a not good match?! Slaine still puzzles me, why he turns against Earth, is he doing this for Asseylum, for himself or for other people of lower classes? No matter how noble his motives, the means does not justify, he is basically kill other people to achieve what he wants, I think he will die (reminds me of Zankyou no Terror, when Japanese government used children to justify their goal). I think she thinks that she will never awake. Now that she is awake I think Lemrina might want to kill her because she would an obstacle for her now. Eep…I wasn’t expecting you to reply to comments from my LJ here! Before Inaho apologies to Inko, he said: “But I can’t see what I really want to know.” Which is the princess, I think he is apologizing to her not returning her feelings. Inko said “Mo”, which in English was translated to “Jerk”. No, I don’t think that’s right. First, I doubt Inaho has even noticed that Inko likes him, so focused is he on Asseylum and the war. Second, his second line of “I didn’t want to get you involved” makes more sense if the apology is about him not telling her about Mazuurek. I’d be pressed to think of a way for it to be connected to his not returning Inko’s feelings. The ‘no similar names’ thing in Asian culture is more about surnames: you’re not meant to marry someone with the same surname because that means you’re ‘related’ to them. One of Slaine’s major goals ever since Saazbaum told him about Vers history has been to change the Vers system that has arguably led to this horrific and destructive war. I don’t think it’s entirely clear yet what he’s trying to do, but this is obviously the major turning point. To the viewer, she was an innocent princess but now she is a bad girl with a gun. Nah. Aoki has always said that that shot in the opening is symbolic. But it signifies Asseylum making a decision about whose actions and goals she is going to oppose, presumably. After the ending of Season 1, I said Inaho is in love with Asseylum, if you can see that than you will understand. Inaho has 2 battles, one is Earth against Mars and other is against Slaine. The battle against Slaine, the prize is Asseylum, for Inaho, he is looking her affection and also hers dreams, the war peace. Inaho didn’t want to get Inko involved in his second battle because it has to do with Asseylum. I personally think Inaho has a lot in common with Arata character and Slaine has a lot in common with Taichi character, LOL. Hm…personally, I don’t think Inaho is looking for Asseylum’s affections per se. I think he’s realistic in the sense that, under normal circumstances, he’d never be able to be with her anyway, because she’s the princess of her country. But Inaho is driven by his love for Asseylum: he wants to be her strength, he wants to help her achieve her dreams. And after episode 12, he also feels responsible for what happened to her, for not only was it his plan they were following, she was also shot trying to help him. Inaho leaving Inko (and Yuki!) out of his plan to break Mazuurek out of prison shows that he doesn’t want to use them for his goals, even though he knows that they would support him no matter what he does. And that’s where the contrast is with Slaine, who is using Lemrina in that way. I’m not going to compare A/Z with Chihayafuru. Even if there are some minor similarities on the surface, they’re very different stories and characters. I really enjoyed your translations of them. The current episode was enjoyable. Both sides continues to advance, though I really much prefer the Vers more. I was also conflicted about the princess’ awakening. Was she really in a coma, or put to sleep by Slaine? It also seems like Inaho’s goal or mind this season is all about the princess. Poor Inko. But the one I pity the most is definitely Lemrina..
What did you think about the symbolism of the roses? And about Slaine’s talk about the ‘impossible’? Was it all about giving up hope in the princess’ awakening? The political intrigue is all on the Vers side, which makes following them more interesting story-wise. For the most part, anyway. I personally really like the Earth side for the interactions between its characters. As this episode showed, even though the princess is what’s driving Inaho, he also tries to keep the other people dear to him (Yuki, Inko) safe. Personally, the subtle little exchange between Inaho and Inko about Mazuurek was my favourite part of episode 18. Though the Slaine-Lemrina exchange was really painful to watch as well. Thank you for doing this and the summary. Well…the summary’s mostly for me and what I want to rant or spam about. And that was someone else’s translation. And whilst they’re a bit too literal for my liking, I learnt something new. Puns galore! So thanks!